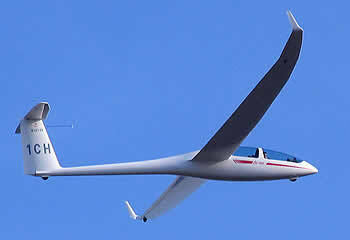 A glider, or sailplane, is a type of aircraft that does not have an engine. 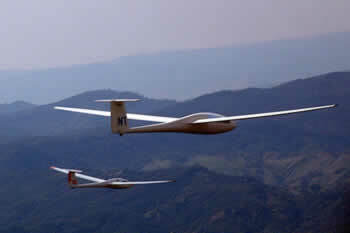 Usually, an airplane tows the glider aloft, although the glider may also be launched like a kite, using a winch or even an automobile to pull it into the air. 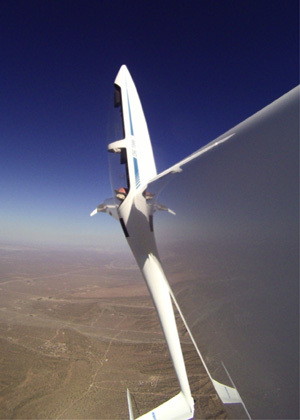 At the desired altitude, the glider pilot releases the towline, and begins to glide. If the air is still, the glider slowly descends to a landing. However, the air is rarely completely still. 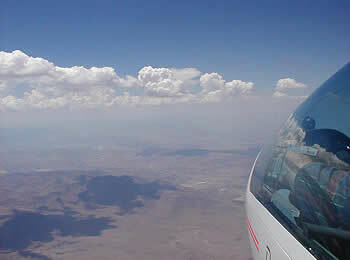 Often updrafts, or "lift", exist which a skilled pilot can use to gain altitude. In a sailplane race, a course is set around one or more turnpoints, with a finish line at or near the starting airport. Typically, a sailplane contest lasts several days, with one race being held on each day. 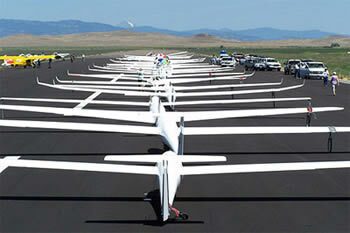 Before the race starts, all the sailplanes are lined up on the runway. Once the lift is strong enough, the gliders are towed aloft to an altitude of 2,000' above the ground. After all of the gliders have been launched, the race is started. The pilots must then fly from the start, around the turnpoint(s), and back to the finish line. Global Positioning System (GPS) data is used to verify that the sailplanes flew around the turnpoints. Several factors determine how long it takes the sailplane to fly around the course. These include how fast the pilot can climb in the thermals, how fast the pilot flies between thermals, and how much "sink" the pilot encounters while gliding. Often, a pilot will pass up a weak thermal and instead continue gliding in search of a stronger one. Of course, if the pilot is getting low and is in danger of "landing out", any lift, no matter how weak, will suffice! The winner of a race is awarded 1000 points, with each finisher (i.e. pilots who made it all the way around the course) receiving a fraction of 1000 points determine by the ratio of their speed to the winners speed. Non-finishers (pilots who did NOT make it around the course) are awarded points based on how far they made it around the course, but they always receive fewer points than the slowest finisher. The winner is the pilot who accumulates the most points at the end of the contest.